Michael Jordan and the Chicago Bulls were winning championships when Boston Bruins defenceman John Moore was a kid growing up in suburban Chicago. The White Sox won the World Series when he was 14. The popularity of the Cubs and Bears was sky-high, even if they weren’t up to snuff. But hockey was the sport that caught the fancy of this youngster in Winnetka. His father cheered on his beloved Blackhawks decades earlier when Bobby Hull and Stan Mikita pushed the local team to elite levels. Moore picked up his Pop’s passion for the Blackhawks. “When I was growing up hockey wasn’t near as popular in Chicago as it is now,” Moore said. “When I was growing up the Blackhawks weren’t on [local] television. It was kind of the dark days of the franchise. If it wasn’t in the backseat of the local sports scene, it was maybe taped to the roof. If he wasn’t shooting and stick handling tennis balls in the driveway of the family home Moore was skating laps at the rink at the end of the street. “Being a father now I realize that to drop me off at the rink was their idea of daycare,” Moore joked. When he was 15 and playing for the Chicago Mission a new coach showed up on the scene who would cultivate Moore’s talents to a new level. His name was Ed Olczyk and his son, Tom, was a teammate of Moore’s and Eddie Jr. would later join the fold. The older Olczyk was a local icon. He started and finished his 16-year career with the Blackhawks and in between won a Stanley Cup with the 1993-94 New York Rangers. He had moved back to the area after a two-year stint as head coach of the Pittsburgh Penguins. “It was not like growing up in one of these Canadian towns where it seems like there someone every year from the area is in the NHL,” Moore said. Moore has followed from a distance as Olczyk has gracefully waged his battle with cancer and used his platform as a popular broadcaster to further the fight against the disease. Moore’s time with Olczyk helped him land a spot with the local Chicago Steel of the USHL. He was drafted 21st overall in 2009 by the Columbus Blue Jackets and before he knew it he was traded to Olczyk’s old team, the Rangers, and went to the Stanley Cup final four years ago. 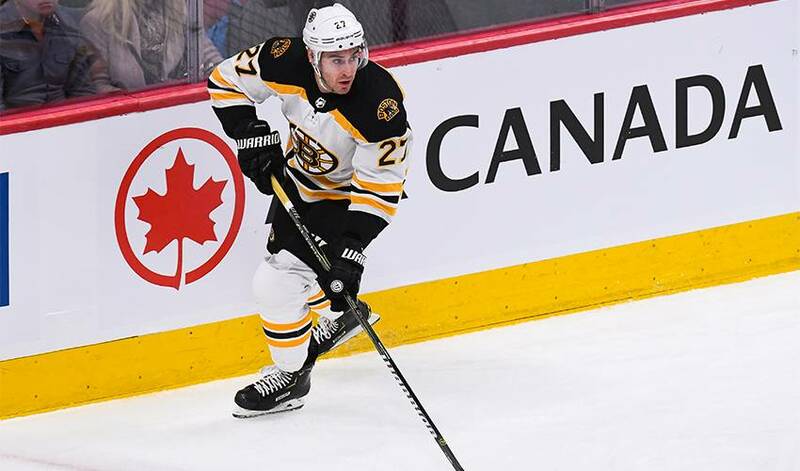 Now, in his first season with the Bruins, Moore will have a chance to play with Boston against the Blackhawks at the 2019 Bridgestone Winter Classic on New Year’s Day at Notre Dame Stadium, where the legendary University of Notre Dame Fighting Irish football team plays its home games. If you’re from Chicago you likely cheer for the Fighting Irish. Moore did and he’s understandably excited about the Winter Classic. “You could commit a crime in Chicago when Notre Dame is playing football on Saturdays,” Moore said. “Everybody is watching. There is such a strong tradition down there as well as a connection between Chicago and Notre Dame football.